Most people love rice crispy treats......Not me. I think there is just something off about the flavor and always have. But I have always made them for my family and friends and they all LOVE them. So I thought if you don't like rice crispy why not try a different cereal and make them instead. 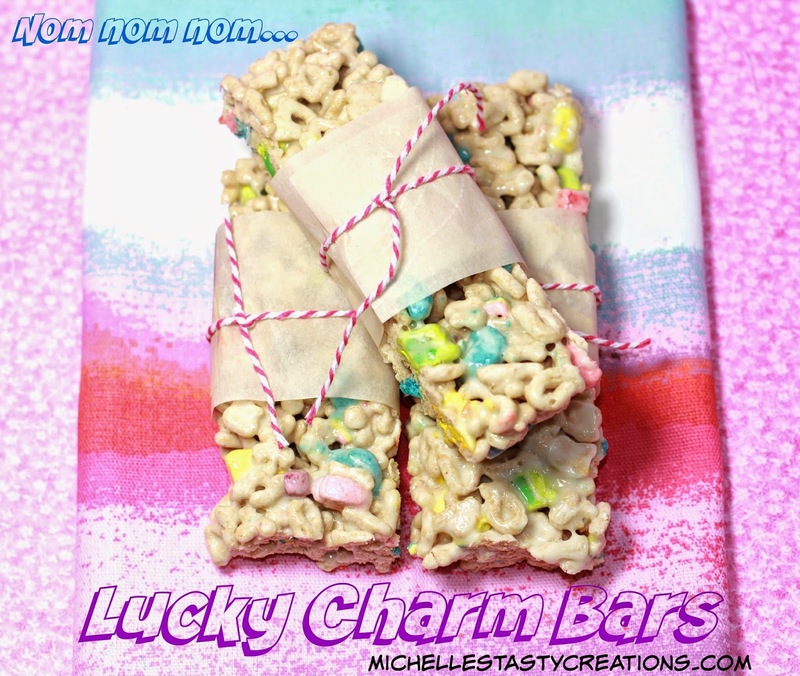 Plus, my son and grandsons love the Lucky Charm bars that I used to be able to get at Target. You know the saying, necessity is the mother of invention? Well this was one of those moments where I thought I can make those just as tasty and they will be homemade which is always a plus. So I made up a batch the other night and boy are these babies addicting! and, and, and, just run to the kitchen right now and make a batch for yourself and you won't need me telling you how yummy they are because you'll know. And your family will let you know. And if you're nice enough to share, your friends and co workers will also let you know. Take the 1 Tbs. of butter and spread it on the inside of a 9 x 13 baking dish (I don't use a spray in these types of snacks because I think it lends a funny flavor because it doesn't bake away like in a baked dessert). Set aside. In a large pot, melt the butter and marshmallows over low heat until completely melted. When the marshmallows are almost all the way melted use a rubber spatula to smoosh (yes that's a word I use) them and they will incorporate faster. Turn off the heat and add the cereal and stir until it is completely incorporated with the marshmallow mixture. Pour into the prepared 9 x 13 baking dish and using the spatula press into the dish. It will be very sticky at this point. To get the bars nice and compact take a piece of parchment and lightly butter one side about the same size as the baking dish. Lay it over the bars and using your hands press the bars into the baking dish. Let the bars set up for at least 2 hours before cutting. I used a bench scrapper to cut them into rectangle pieces but you can make them whatever shape you would like. Using cookie cutters would be cute for kids lunches or snack time. Mmm mmmm. These were so delicious! I'll be making them again and again and I'm sure you will too. These look sooooooooo cute and delicious Michelle!! These bars look adorable for the Valentine's Day celebration! !